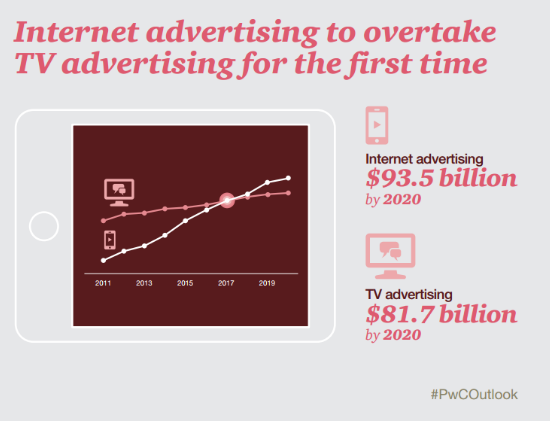 PwC released their annual Global Entertainment and Media Outlook report, predicting that internet advertising will overtake broadcast advertising by next year. PwC’s report forecasts media and entertainment industry revenue and ad spending over the next 5 years. By 2020 total spending on internet advertising is expected to be $93.5 billion while TV ad revenue is projected at $81.7 billion. Overall entertainment and media spending will be $603 billion in 2015 and reach $720 billion by 2020. The U.S. will continue to lead the world’s in internet advertising market. By 2020 the U.S. will receive $93.5 billion in internet ad revenue and China will be a distant second with $44.6 billion spent. According to the US entertainment and media outlook: 2016-2020, the next five years will hold major changes for how people watch TV and video. As consumer wants and expectations continue to change, so too does the TV and video industry. Today’s and tomorrow’s definition of what it means to be a “media company” will continue to evolve, as companies — not just entertainment and media companies — invest in content and direct customer media relationships. We will continue to see a rapid increase in new entrants and competitors in the space as subscriber-based businesses continue to consolidate. Operators are also attempting to target cord-cutters and cord-nevers by marketing their OTT streaming and download services–two areas that will represent tremendous growth potential for this industry’s foreseeable future. OTT (Over the top) streaming subscription video on demand revenue is expected to go from $6.4 billion in 2015 to $10.4 billion by 2020. US internet advertising revenue will continue to surge forward, with mobile seeing the most rapid growth–all forms of mobile advertising will continue to grow in the coming years. One key driver is the shift in search from laptops to mobiles, with mobile paid search internet advertising having seen tremendous recent growth. While the music industry’s first stage of digital transition saw downloads overtake physical formats in terms of retail sales and revenue, the current stage has consumers moving away from ownership towards access. Subscription music services will soon be the primary form of paid content in revenue terms. The PwC study also looked at the movie industry and noted that for the first time electronic home video revenue eclipsed the movie box office in 2015. Home revenue was $11 billion while theater box office revenue generated $10 billion. PwC is also predicting that the US will lose its top market position to China in 2017. Looking at the video game market, PwC expects the video game industry to thrive over the next 5 years.